Dante and I both grew up in Indianapolis. Throughout the 13 years that we have worked together we have often discussed the city: our memories of growing up here, the changes we observe taking place, and the future we want to help shape for Indianapolis. 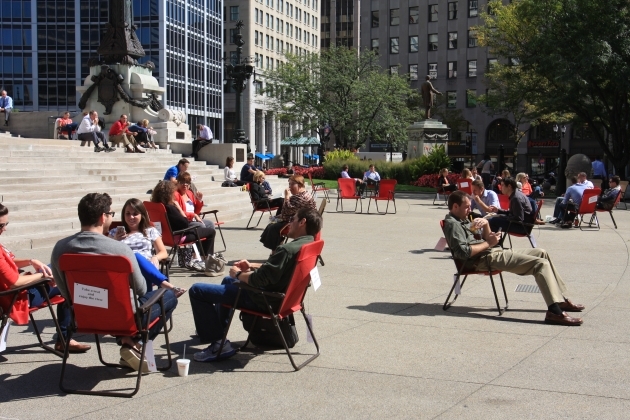 So many of the conversations with our colleagues, particularly since Indianapolis hosted the Super Bowl in 2012, eventually drift to the idea of placemaking in Indianapolis. How do we build on the momentum from the hugely successful Super Bowl? What kind of daily experience do we want people, both locals and out of towners, to have while they are in Indianapolis? Where are the places that define us as a city and what kind of memories do people make in those places? The list of questions goes on and rolls easily off the tongue. But the answers, well, they come a bit slower. What I do know is that I love this city. And that she whispers into my ear constantly that she loves me too. Indy Loves You is an effort by Dante and I to be in dialogue with the city we love so much. We will be revisiting locations that have been meaningful to us and exploring sites where we haven’t spent nearly enough time. We will be asking questions, of ourselves and the people around us, to help us better understand what it means to be in this place. We’ll be creating temporary installations around town to create dialogue about how place-making can be done here. And we’ll be documenting our adventures here on the blog. I hope you’ll join us in this conversation because we love Indy and Indy loves you. Thanks for the very comfortable chairs at the monument today! Sitting in the warm sunshine surrounded by other folks was great. Made it hard to go back to work…. So glad you enjoyed it, Bob! We’ll be setting them up again on Monday, October 28. It is expected to be near 60° and sunny.